Me & my online co-conspirator Guido have set up a petition as a show of support for an Absolute Edition of Alan Moore & JH Williams IIIs PROMETHEA. If we can get enough signatories, were hoping that the book will arrive sooner rather than (years) later. We have JHW3s blessing in this venture. 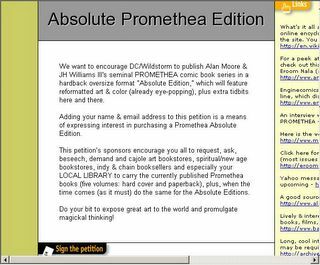 So in the interest of summoning into existence such a fine and wonderful and possibly useful grimoire, here as follows is the petition link: Absolute Promethea Edition Petition if need be you can both support the project and state that you cant buy it. There are many cool Promethea-related links (NEW as of two days ago, for those of you who have already voted) on the petition site too!" Click on the above image to visit the site and sign the petition.